The Plum Race 145 bindings are identical to the Race 135, with the exception of a steel rear forks instead of titanium. The steel forks provide a higher forward release value, which is suggested by Plum for skiers weighing over 70kg (154lb). The tradeoff is an extra 9 grams (0.3 ounces) of weight per binding, offset by a savings of around $40 due to steel's relative abundance. With either fork, you'll get an exquisitely machined race binding that is also designed to withstand everday touring. Hardened steel forks are combined with titanium, Fortal® aluminum and Ertacetal® high strength plastic to create a durable binding. Simple wedge level blocks your heel from locking in, making for fast transitions between uphill and downhill modes. Heels turn 360 degrees for flat-on-ski mode and completely-backwards mode (that's not a thing but you can do it). 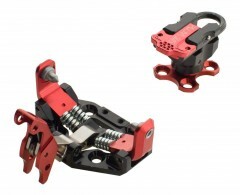 Optional crampon attachments accept most tech-binding compatible crampons (5 grams / 0.2 ounces). After two seasons, one of my heel pieces has developed significant lateral play in the pin. Is there a way to tighten the heel pin? Hey Peter, thanks for reaching out! I'm interested to get to the bottom of this, can you send in a few photos or a video or two of the play? Overall: Five Stars for the baseline option among Plum’s three different race bindings. You can go a bit lighter with the Ti heel pins on the Plum 135 or opt for the integrated fore-aft adjustability of the Plum 165 (see my reviews of both). But the Plum 145 is the baseline choice, and compares very well with the competition that I have used. Background on product familiarity: I’m into my fourth season now on various Plum race bindings. So far I have 279,000’ vertical on the Plum 135, 178,000’ vertical on another pair of 135 heels (with Dynafit toes), 112,000’ vertical on the 165, and 12,000’ on another pair of 165. Biggest boot used on any of these setups has been the Dynafit TLT5 Performance, and widest ski has been the 75mm Hagan Cirrus. Other race and near-race bindings I have used include the Sportiva-rebranded ATK RT, Dynafit Low Tech Race, and Dynafit Speed Superlite. First, the first impressions out of the box: If you’ve never seen a rando race binding before, you’re in for a shock, although of the favorable kind, as this is a “Tech”-style binding stripped down to its absolute essentials. If you’ve seen other rando race bindings, the 145 is almost kind of generic, but in a good way: Plum has focused for years now on refining the same basic design, rather than take risks with anything drastically new. The toe mounting pattern is the de facto standard for rando race bindings, using the Dynafit pattern (except for the Radical models) while skipping the fifth center hole. The heel pattern is unique to Plum, more tightly clustered than the other four-hole competition (which means you can’t use the adjustment plates from other brands). A ski crampon attachment is an extra-charge accessory, so be sure to budget for that if shopping on price. As with all full-on race bindings, the heel cover offers only a single kind of “half-step” elevator position, which is optimal for optimal skin tracks, but feels a bit too low for too-steep skin tracks. For extended flats, you can rotate the heel unit for no elevator at all, but then your boot heel is resting directly on the ski topskin for a slightly negative skinning position. Second impressions, in use: I have never prereleased, despite skiing them sometimes in-bounds just as I would my alpine downhill race gear, and despite some backcountry descents on “firm” steep uneven “snow” that I would prefer not to recall now in detail. The coupling between the boot and the ski feels as tight as with any Dynafit or other “Tech”-style binding. The toe lever requires a bit more force to exit than with other bindings, although this is still a fairly trivial concern (yet nevertheless noticeable). The ski crampon clasp is very minimalistic, but has worked well for lots of steep tricky skinning. And its minimalistic design allows some subtle bending to accommodate variances among different crampon brands. Fortunately I have never had the chance to test the release characteristics in a fall, but I have tested the lateral release values with a VSSE Release Calibrater: somewhere in the very high single digits. This is a function of the relatively stiff lateral resistance at the heel, the surprisingly strong toe wing springs (stronger than those on the Plum Guide or Dynafit final-generation Vertical/Speed), the pincer span, and the action of the toe lever. The action of the toe lever is also significantly influenced by its very strong stock spring. A lighter toe lever spring is also available, although it’s so light that it seems to be no different than going without any spring at all. Without the strong stock spring, the release value goes down by about one full number, although still remaining in the high single digits. Without that spring, the toe lever will no longer automatically go all the way into the most upright position for skinning, although the toe springs are still strong enough for most skinning, and manually repositioning the lever is of course very easy.